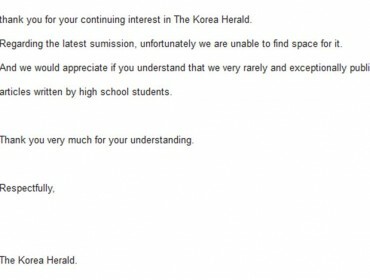 Editor’s Note: This begins a loose-leaf series on different types of Religion and Spirituality practiced in Korea. Christianity, Buddhism, Islam, Shamanism will be reported on from an eye-level perspective. 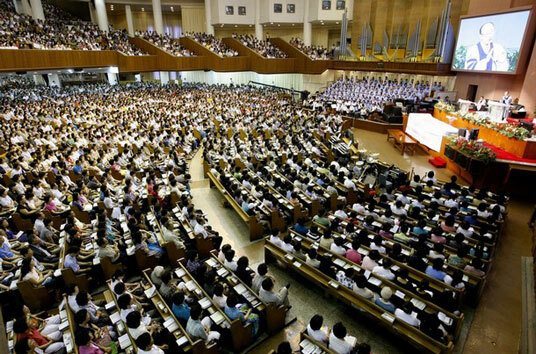 3wm editor Mizaru begins the series with a visit to The Yoido Full Gospel Church in Seoul. I’ve been going to church all of my life. Maybe not as consistently as I avoid birthdays and enjoy Halloween, but I go and will continue to go. My church going consistency is marked by one inevitable thing, and that is I am always late to the service. Whether at Immaculate Conception in the Bronx or Saint Michan’s on Dublin’s North Side or even at The Sunshine Rescue Mission in Flagstaff, Arizona and today at the largest Protestant Christian church in the world I get there late. The Yoido Full Gospel Church in Seoul, South Korea has about 1 million members so I have to assume not everyone can get there on time. 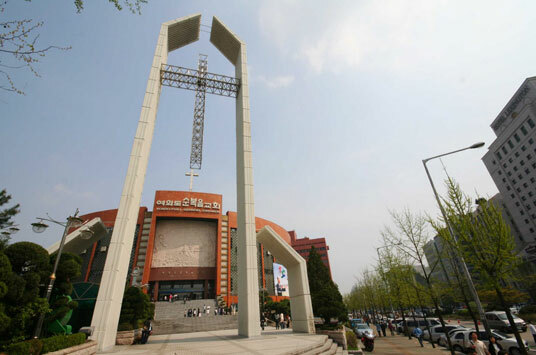 It is the mega-church of Asia and represents the new-affluence idea in South Korea that bigger is always better. 4. CAUCASIAN CHRISTIAN MAJORED IN THE THEOLOGY IS PREFERED. I am not against reading the Bible but to how many people and where exactly? 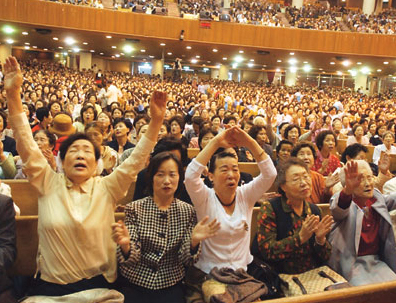 It could be in one of the several basement churches of Yoido to over a dozen or so over controlled and perhaps undersexed Korean middle- aged women or maybe I’ll be center stage in the middle ring of the whole congregation. Getting out of the Yeouinaru subway stop on the Purple Line number 5 is casual enough. Not too many people packed around like they are looking for a white foreigner to show them the way to the lord and when getting up to the street it’s no surprise that none of the locals I ask can tell me where the church is. They will know that it is in their neighborhood as a landmark offering them social cache and a spike-up point for local real-estate values, but finding the location, location, location is not clear. Continuing to walk along the Han River a police officer smoking a slim menthol cigarette knows the church by calling it “Yoido Town” and motions me to continue forward. The Yoido church complex is about 500 meters straight away from the subway exit and the clemency of the weather invites a small number of Sunday larkers down to the Han. Parents, kids and bicycles, a few dogs and even an impromptu baseball plate is set up for a school group to get away from the books for an afternoon and bat around a tennis ball. 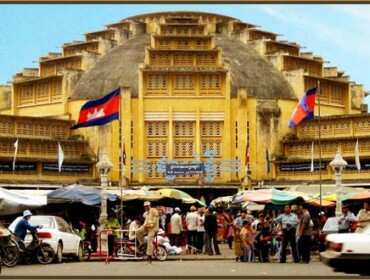 The Yoido Gospel Church is a rotunda and the physical dynamic of hosting the largest congregation in the world is not immediately perceived. At the entrance I meet Foreigner Guide and Senior Deacon B.J. 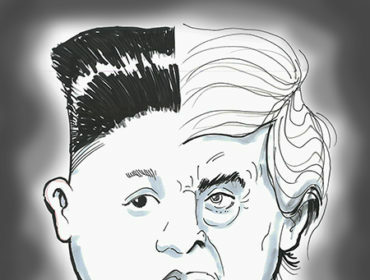 Kim. He explains that not everybody knows that we are standing under two large hands raised and cupped to prayer. I agreed with him that I could see it but the “Hands for Prayer” looked ineffectual and not at all as a reverent invitation and a gateway to prayer. Perhaps it’s the height of them that is meant to impress or that it takes some inside knowledge like you have to be told to be in the know on what you are looking at and what they are supposed to represent. Inside is buzzing and packed so much so that as Mr. Kim shows me to the “Foreigner Seats” he apologizes that all of the first balcony seats are filled and I’ll have to take part in the service from an overflow area where the founder and Senior Pastor of Yoido Church, Rev. David Yonggi Cho cannot be seen. Being late to church gets me a blocked view so far; so I need to explain to Mr. Kim how I was contacted by a recruiter to do Bible readings and partake in fellowship today, and yet he seemed to not know about any kind of appointment made with a foreigner for that. He detailed the number of rooms below the main hall that were designated as “Foreign language and interpretation rooms,” and then quickly offered to bring me to his senior pastor for some clarification. But, alas, the choral music has started and Mega-church time Sunday afternoon is beginning. The whole sound seemed pre-recorded and canned but that’s because I could not see the orchestra and chorus who were organized to the left of the alter and way out of my view. Nor could I recognize the opening music before it was gone and followed for the next three minutes by a mashup of images and sounds from plague-stricken Haiti. No screens hung from the ceiling or raised and angled along the sides of the alter like you might see in a mega-rock-concert—just the unobtrusive flatscreen at the center of the alter. The congregation was focused on an analogue and digital documentary of the human grotesque and then of the human triumph. Amputees screaming in their loss and then rejoicing when the prosthetic legs and arms were fitted on them. A lost and found moment in more than one way; where the Yoido congregation can take pride that their in-house donations are doing good in the outside world. You could take sides with that or against that as to what is the reality: your church helping the poor and skimming so that your church can stay rich and really do some good, or, scamming for your rich church and using the poor to justify your wealth. Pastor Choi called his church’s Mission a, “Success story in Haiti.” In my experience the truth can be that both of these possibilities simultaneously exist for real. There was a spotty but wireless translation system which allowed me to hear the service interpreted into English th rough a very much younger man’s voice than the 75-year-old pastor’s. He is fit and curbless on the podium with an avuncular posture that never seemed too tweaked by great spiritual or even everyday battles. And as I am able now to reposition into more far-reaching views, the Yoido church reminds me of being inside Madison Square Garden. And like the Garden or most indoor arenas and casinos, no natural light gets in. The main sermon is about to begin and I adjust my language box from English to Chinese to Russian and back to English, I sense that I am experiencing some kind of international sporting event. Like a pro wrestling match between a good guy and a bad guy. I just can’t reckon what represents what right now. “Hello Lord good to See You!” These were the first words that Pastor Cho had the congregation say back to him. Here is the exact “Introduction” of the Sunday’s teaching. together for only half a year, children grow up to resemble their parents. That is called the principle of visualization. Maybe so but in the many moons that I have spent time living in Catholic houses and discussing the Bible this was never an interpretation of Genesis that I can recall. So the theme of the message is visualization. His gospel underpinning is the book of Genesis which he preaches to the congregation not as a narrative to be explored but literally as talking points. The most audible talking point to the all in the congregation is how somehow the Israel in the Old Testament and Korea in the Brave New Asia were and are both on the same collision course to affluence. The most fascinating segment in this sermon part one was an astonishing name drop. Pastor Cho kept going on in circular but very non-razzmatazz language about a Wall Street Journal article and the story of four sisters who fought through adversity to become CEO’s and Vice-Presidents of companies in America. I don’t mean to take an older pastor whose first language is not English and throw him to wrestle on a mat, but I Googled for the story which seemed to be the sugar-stick part of his sermon and could find nothing of this. But, perhaps, it is lost in cyberspace. What should really be maintained is actually that America is never a bad-guy in the Korean Christianity that I have encountered. 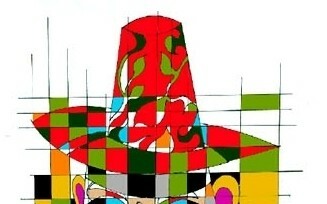 It is the beacon on the hill, a promised land whose equation is analyze failure and try again. And whose tagline is the advice that I guess we all want to hear East or West. What the thief in the night whispers and wants you to remember in the morning: everything that you go through in this world will pay off. It’s never too late to come to church: it’s great to be rich. 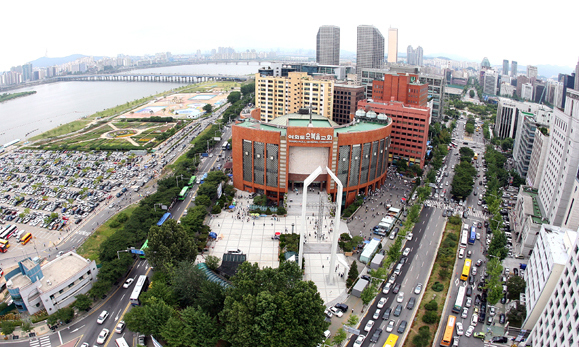 Part 2 will include an interview with Pastor Cho and hopefully a review of Mizaru’s reading the Bible at Yoido church. Coming next week from 3WM.